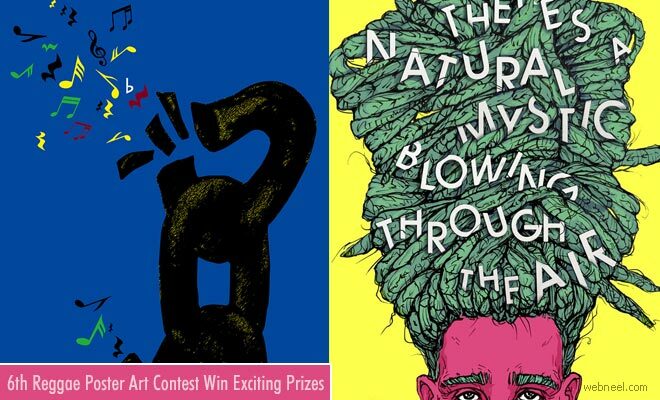 Poster Art Contest : The 6th International Reggae Poster Art contest is open for entries till March 1st 2018. Use your imagination and create a poster about Reggae Music. The hundred best posters will be selected by the jury and will be part of the Reggae Exhibitions conducted around the world. According to Reggae,"The objective of the International Reggae Poster Contest is to build awareness for positive Reggae music and to celebrate the global achievements of Reggae and its impact on the world. The term Reggae used by the contest encompasses all the popular Jamaican musical genres; Ska, Rocksteady, Roots Reggae, Dub, Dancehall and the unique Jamaican Soundsystem". You can submit poster designs based on the genres mentioned above. Poster Art can be designed by a single graphic designer or can be a combined team effort. There is no entry fee. It's open to all graphic designers and artists around the world. Entries should not have been published before on social media sites. International exposure by means of exhibitions across the world alongwith additional prizes of DVDs, books and music. A book printed with the 100 poster artworks.